Millburn, NJ–Dr. 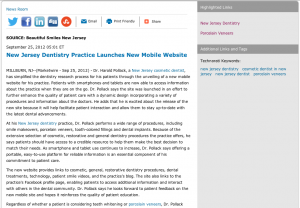 Harold Pollack, a New Jersey cosmetic dentist, has simplified the dentistry research process for his patients through the unveiling of a new mobile website for his practice. Patients with smartphones and tablets are now able to access information about the practice when they are on the go. Dr. Pollack says the site was launched in an effort to further enhance the quality of patient care with a dynamic design incorporating a variety of procedures and information about the doctors. He adds that he is excited about the release of the new site because it will help facilitate patient interaction and allow them to stay up-to-date with the latest dental advancements. At his New Jersey dentistry practice, Dr. Pollack performs a wide range of procedures, including smile makeovers, porcelain veneers, tooth-colored fillings and dental implants. Because of the extensive selection of cosmetic, restorative and general dentistry procedures the practice offers, he says patients should have access to a credible resource to help them make the best decision to match their needs. As smartphone and tablet use continues to increase, Dr. Pollack says offering a portable, easy-to-use platform for reliable information is an essential component of his commitment to patient care. The new website provides links to cosmetic, general, restorative dentistry procedures, dental treatments, technology, patient smile videos, and the practice’s blog. The site also links to the practice’s Facebook profile page, enabling patients to access additional information and interact with others in the dental community. Dr. Pollack says he looks forward to patient feedback on the new mobile site and hopes it reinforces the quality of patient education. Regardless of whether a patient is considering teeth whitening or porcelain veneers, Dr. Pollack says he is hopeful patients will take advantage of the new mobile website to help broaden their understanding of the advanced dental treatments the practice offers. He also adds that as with any dental treatment, patients should research each procedure and practice to be certain the information they receive comes from a licensed and experienced dentist. Dr. Harold Pollack has been practicing dentistry for more than 30 years. He is a graduate of Temple University School of Dentistry, where he earned his Doctor of Dental Surgery (DDS) degree. Since then, Dr. Pollack has devoted more than 4,000 hours to continuing education and is an active member of a number of professional organizations including the American Academy of Cosmetic Dentistry, Academy of Computerized Dentistry of North America and the American and New Jersey Dental Associations. He has also been selected as one of the “Best Dentists in America” and a “Top Dentist” by NJ Monthly. Located at 280 Millburn Avenue in Millburn, NJ, Beautiful Smiles by Dr. Harold Pollack can be reached at (973) 947-4331. The practice can also be contacted online via the website beautifulsmilesnj.com or at facebook.com/drharoldpollack.